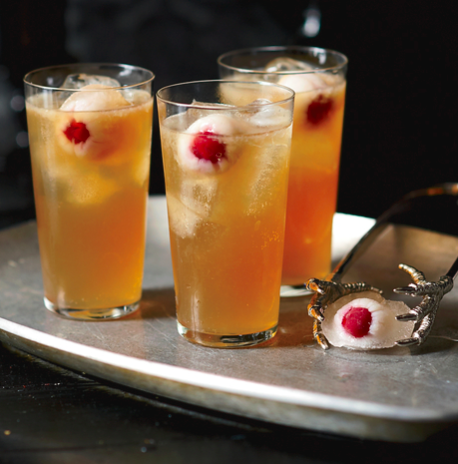 Happy Friday lovebugs, here are some Halloween inspired recipes for this weekend. Heat about 1/4 cup EVOO in a small skillet with the butter. When the butter foams, add the garlic and stir 1 minute. Add the breadcrumbs and stir to soak in the oil and butter. Toast until light golden, then remove from the heat and cool. Mix the cooled breadcrumbs with the cheese and parsley. Trim the tops off 6 peppers and reserve, then scoop out the seeds. Using a small, sharp paring knife, cut out a jack-o'-lantern face in each pepper. Set the peppers upright, and if a pepper is very unstable, trim the bottom to make the pepper stable. Season the peppers on the inside with salt and pepper, invert the peppers and place on a baking sheet, tops alongside. Seed and chop the remaining bell pepper and reserve. Salt the eggplant and drain 15 minutes in a strainer or on a towel. Spray the peppers with a little cooking spray and roast to char the peppers at the edges and tender-crisp doneness, 10 to 12 minutes. Remove from the oven and cool to handle. Heat the remaining EVOO in a large, deep skillet. Add the reserved peppers, thyme, chile, eggplant, onions and zucchini, and some salt and pepper. Cook the vegetables, partially covered and stirring occasionally, until tender, 12 to 15 minutes. Add the tomatoes, stir another minute, and remove from the heat. Combine the breadcrumbs with the vegetables and taste to check seasoning. Pour the tomato sauce into a casserole dish. Stuff the peppers, overstuffing the cavity a bit, and set the tops in place to complete the Jack-o-Peppers. Place the peppers into the dish as you fill them. Cool and store for a make-ahead meal. 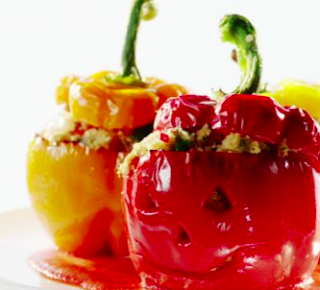 To serve, preheat the oven to 400 degrees F and roast until the peppers are hot through, 30 to 35 minutes. Combine the cake mix, yogurt, 1 cup water and egg whites in a large mixing bowl and beat until combined. Place the batter into a pastry bag or large ziplock bag with the tip cut off. 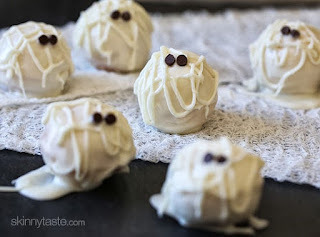 Place the cake balls on a wire rack and repeat with remaining batter. Using a scissor, cut the seam off the balls. Melt some of the chocolate in the microwave according to package directions, careful not to over heat the chocolate. If it's too thick add a drop of oil to thin out. Use the wooden skewer and insert into the cake ball, then dip in melted chocolate. Let the excess drip off then place each ball on parchment or wax paper. Place remaining chocolate into a piping bag and drizzle onto the tops of the balls to make a criss-cross effect to resemble a mummy wrap. Place the mini chocolate chips over the chocolate for eyes and set aside to dry.